The legacy of Joint Base Myer-Henderson Hall’s oldest and most storied unit will soon be carved in metal and etched in stone after a groundbreaking ceremony for the long-awaited Old Guard Monument was held near Summerall Field Nov. 21. Joint Base Myer-Henderson Hall Commander Col. Patrick M. Duggan joined Col. Jason T. Garkey, regimental commander, 3rd U.S. Infantry Regiment (The Old Guard), and a host of current and former Old Guard members in turning over the first shovels of dirt at the monument site just south of Town Hall. 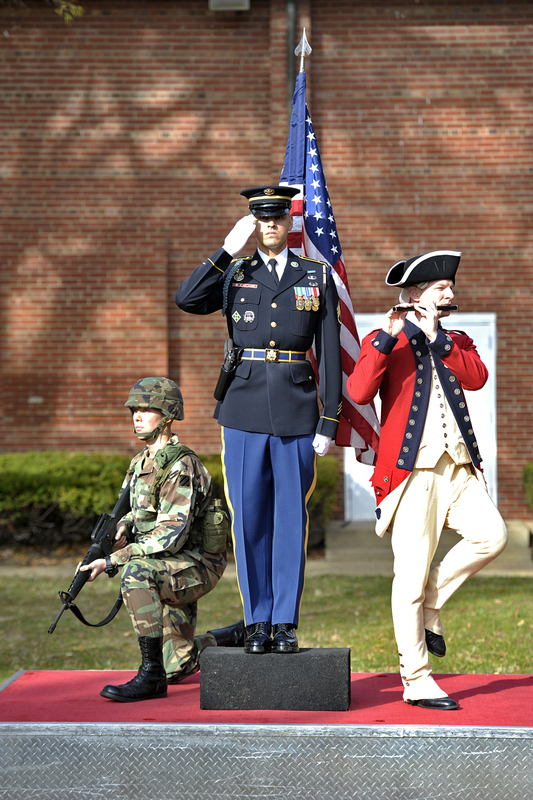 The monument will focus on a larger-than-life bronze sculpture by Barbara Mungenast depicting three Old Guard soldiers – a saluting sergeant in ceremonial Army blues, a fifer from the Old Guard Fife and Drum Corps, and a combat infantry rifleman – representing the regiment’s multifaceted missions. A replica headstone will rest at the base of the sculpture, calling to mind the regiment’s solemn duty to provide military honors to all interred at Arlington National Cemetery. The sculpture will be set in a public plaza designed by architects Michael Bratti and Alex Zaras, and will feature stone fixtures and green spaces. Gifted to the U.S. Army by the nonprofit Old Guard Monument Foundation, the monument is expected to be completed by mid-2018. The project is the brainchild of retired Army Col. James F. Laufenburg, who was the Old Guard’s regimental commander on Sept. 11, 2001, when the unit deployed to the Pentagon to maintain security and assist in rescue and recovery operations. At the ceremony, Laufenburg said that witnessing the dedication and professionalism his soldiers displayed during that crucial mission inspired him to spearhead the creation of a permanent monument to the Old Guard’s venerable history and ongoing service. “After the experience down at 9/11 [the Pentagon], I said to myself, this is the oldest active-duty infantry regiment in the Army today, and there is no plaque, monument, anything that recognizes them for that, so that’s literally where that came from,” he recalled. Laufenburg added that the monument would not only stand as a lasting tribute to the Old Guard, but is also meant be a functional space that will be woven into everyday life on the post. Garkey echoed Laufenburg’s hope that the site will serve as “a great focal point for Fort Myer,” and he expressed pride in seeing the monument break ground under his command. Garkey praised the artist and architects who designed the monument, noting that he particularly admired the way Mungenast’s sculpture captures the Old Guard’s distinctive traits while also conveying its unique role as a symbolic representative of the Army as a whole. “From a distance, it looks like the Army,” he remarked. Garkey said he was honored by the presence of the Old Guard veterans who returned to their former post to share in the celebration. Among the former commanders on hand was retired Col. Greg Gardner, who led the unit from 1997 to 1999.